MicrosoftMicrosoft Office chief Qi Lu. 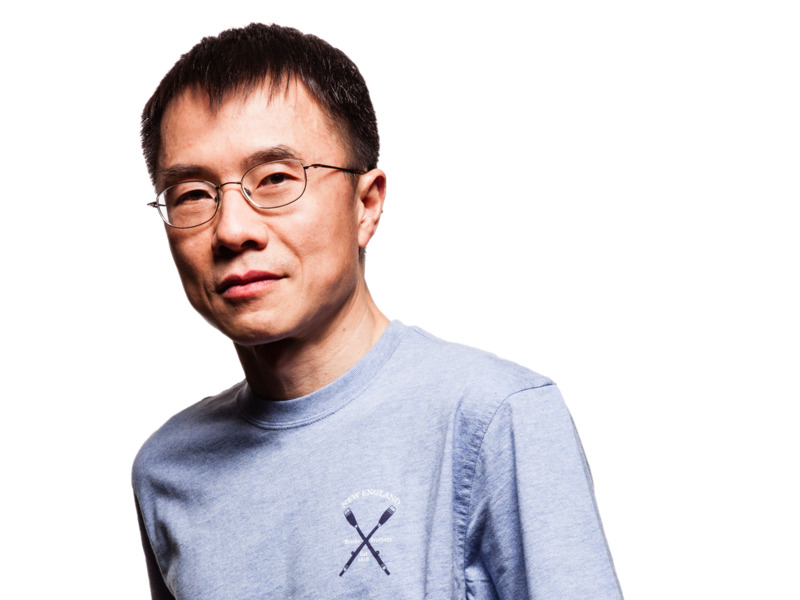 That’s why Microsoft Office boss Qi Lu took to the stage at this week’s Microsoft Build conference to call on developers to build new apps and extensions for the stalwart productivity suite — after all, it’s just good business. With that wide of an installation base, Lu says, there’s plenty of opportunity for an enterprising software developer to sell straight to users of Office 365, the cloud-based version of the productivity suite. That’s especially true given how much time people spend in Office, meaning a huge market for helping people get stuff done. “The typical Office users spend 2 or 3 hours each day in our apps,” Lu says. Lu also highlights Microsoft’s ability to help would-be Office app developers build smarter, better apps. By plugging into the Microsoft Azure cloud, Microsoft is making it easier than ever to build an app that can serve thousands of customers. That includes Microsoft’s new love of chatbots, interactive text-based assistants, which Microsoft is now helping developers build for apps like Cortana and Skype. Lu says there’s a huge opportunity for developers to build chatbots for Microsoft Office that help people get things done. 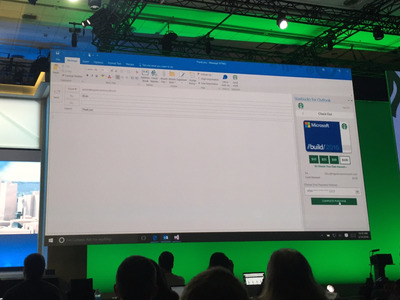 Lu also hyped up the Microsoft Graph — a recently-launched system that lets Office apps communicate with each other and with outside software. For instance, Microsoft showed off Boomerang, an app that can take in a whole team’s Outlook calendar and spit out some free times to meet. Lu describes that data as “the new oil,” a precious resource that helps developers build smarter apps. “This data provides very rich context for your applications to take advantage of,” Lu says. 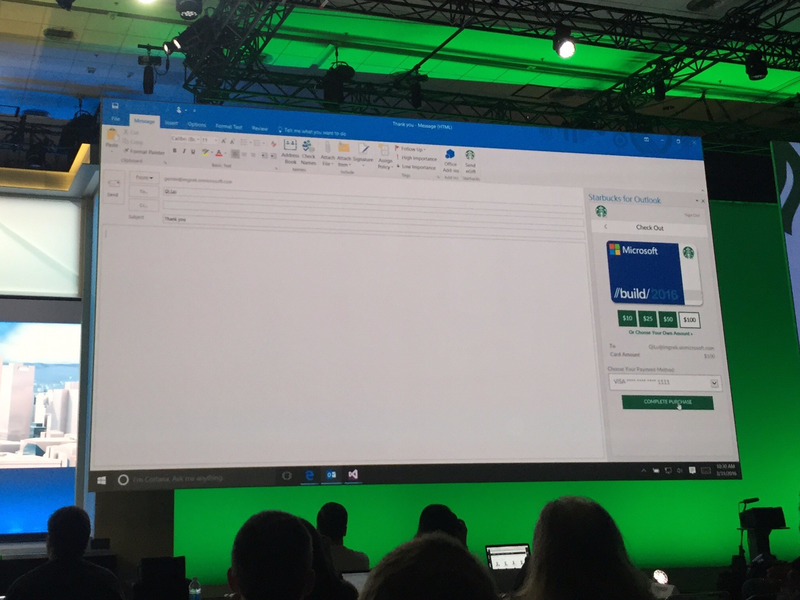 Matt Weinberger/Business InsiderSending a Starbucks gift card in Microsoft Outlook. To that end, Microsoft is making it easier for developers to sell apps that integrate straight into the Office 365 suite, including the ability to view and use outside apps right from within Office’s famous “Ribbon” interface. Users can use the Office App Store to install them directly. “These applications are very simple to use and easy to discover,” Lu says. Microsoft is making a big push for developers, across Windows and its Azure cloud. But Office has a unique position as a suite that runs on Windows, Macs, iPhone, Android, and the web — and so, it has a unique pitch to developers, who can theoretically meet more users no matter which device they’re using.